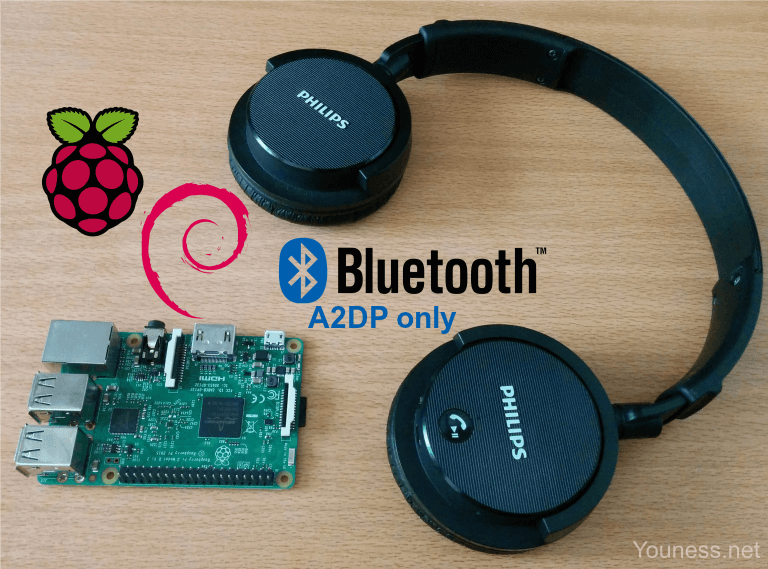 This post will show you how to connect your Raspberry Pi 3 to your Bluetooth headset, using A2DP profile. Please note that A2DP profile supports only audio output, but no input such as microphone. To connect Bluetooth headset, there are several GUI tools, but I recommend to do it using bluetoothctl (part of BlueZ). Turn on the headset, for mine I press and hold the button till I see white blinking LED. Now the headset is correctly connected to the Raspberry Pi. Download and play a sound, you will hear it from your headphone! If you have any question feel free to ask me by comment. Followed your instructions on a fresh install of Raspbian Jesse light and pairing with Amazon echo. I’m able to pair successfully but I only see Amazon as a source and not as a sink (as reported by pactl command). Also, Amazon echo goes silent – I’m assuming that it is sending it’s audio to raspberry pi. I’d there anything I can do to make the echo pair as a sink? I don’t have Amazon Echo so I’ll tell you only what I know as information. The Echo supports two Bluetooth profiles: A2DP and AVRCP. A2DP in Echo is in two modes, A2DP sink (audio from Raspberry Pi to Echo) and A2DP source (the opposite of sink). Now that I have an Echo, I can give you more information about it. It seems that Echo doesn’t show itself as a Bluetooth input, I tried using Raspberry Pi with Raspbian, and a PC with Ubuntu, for both of them, I can only use Echo as A2DP streaming audio, but I can’t see it as microphone (no HSP profile). If this can save your time and others’ too. Hi, thx for your article. I try to send music to my car audio, I can pair /trust and connect to the car audio. But the car audio says “audio paused” it seems to wait to receive a command before to actually play the inputed audio. Using hciconfig I can sent the bytes being send trough Bluetooth..
Hi Philippe, I already had this problem in some car radios using my smartphone. When I have this, I play music and I change volume, this is enough as command to establish the audio sound. An addition: turns out that to avoid terrible choppy slow playback I had to turn scan off once the pairing was all set up (using ‘scan off’ command from bluetoothctl). This could be an issue with my particular bluetooth speaker but if it affects one it probably affects many. And my last comment about making sure to unplug the wired headphones was nonsense and should be moderated out of existence if possible. For scan off, for me it makes sense. Did you turn off Wifi also? OK so turn it off and you will notice sound quality improvement especially for AD2P streaming. Very interesting Post, big thanks for sharing. I managed to connect my speaker ok and tried streaming a longer .ogg file. Every time I try it keeps on getting stuck. so far I didn’t manage to get it unstuck and had to reboot the Pi. tried to turn scan off too. Yeah, I connect the headphones, set them as default sink, they work for like 2 secs. and then they stop working. I’m not able to disconnect the bluetooth or to turn it off and on again, the only thing that works is to reboot. Other problem is that, in those 2 secs. that the headfones are working, the sounds from youtube and Udemy are absolutely distorted. FYI, I’m using a Philips SHB6110. I think your PulseAudio daemon stops after the 2s. Did you make the -1 in PulseAudio settings? For sound distortion, are you using both Wi-Fi and Bluetooth? Oh, and let me thank you for the great post and for the help! Thanks for your post, it was help very much. But I have one issue to get help from you. I followed your post to play music via BT speaker through A2DP. but pulseaudio can’t detect BT-Sink when only one BT device connected to my RPI3. but when second BT device connected to my RPI3, the second BT A2DP sink can be detected in pacmd. [NEW] Device 7A:78:33:AD:2C:E1 BT SPEAKER // the second BT speaker. // sinks has 3 devices including embedded audio, but it showed only 2 sink devices. I think, I’m using the latest packages, but pulseaudio does not seem to detect BT audio device correctly. Are there any work-around or fix ? Thanks for the guide, but I’m unable to reach the goal. I followed every step, but when I try to play the sound I only head a (barely udible) very low noise. Sure. Give me more details about what you did and get as errors. If I try to play an audio file (found some in /usr/share/scratch/Media/Sounds/Vocals and playing with vlc) I hear something (very very low) in the headset, which makes me think that the communication has been enstablished, but not a real sound. Tried to set the headset via gui (right click on volume icon) – same result. pacmd list-cards –> 1 card(s) available. pacmd list-sinks –> 1 sink(s) available. Can you try to play the audio file that I uploaded myself here? Do it with the command paplay. This is t avoid that you try an unsupported audio format, or that VLC is not correctly sinked with PulseAudio. Does the playing of audio ends or not? Put earphones in JACK of Raspberry Pi, maybe the routing of sink doesn’t work well. The playing of the audio ends. Opening a playback stream with sample specification ‘float32le 1ch 32000Hz’ and channel map ‘mono’. Using sample spec ‘float32le 1ch 32000Hz’, channel map ‘mono’. Connected to device alsa_output.platform-soc_audio.analog-stereo (index: 0, suspended: no). Playback stream drained. : 378133 usec. Are you sure the command set-default-sink is OK? Sink bluez_sink.E3_28_E9_20_CD_75 does not exist. Connecting to youness.net (youness.net)|217.160.0.252|:80… connected. After a minute, I block the command typing Ctrl+C and the white noise stops. Connected to device bluez_sink.E3_28_E9_20_CD_75.headset_head_unit (index: 1, suspended: no). ^CGot signal, exiting.cy: 2000000 usec. OK, from what you did, problems start at 19. The sink doesn’t exist. At this step 19. Check your cards with: pacmd list-cards. Here you must have the Bluetooth card with A2DP profile. You will find also the correct name of the sink, I doubt that you are using the correct name, especially with that “headset_head_unit”, it is not for A2DP audio. I’ll do my best to get my Raspberry Pi and play with it to see if there is no issue that I didn’t met in the past. So the Bluetooth heasdet doesn’t appear at all, so you do all that with one console? I advice you to open two consoles one for Bluetooth and one for PulseAudio. Start PulseAudio with logs (pulseaudio -vvvv) and try to connect Bluetooth with bluetoothctl. You have to see a change in PulseAudio console when you do that because it detects the headset. I: [pulseaudio] main.c: Machine ID is 22d72e8074af4e3aa2735f037906a0a8. Hi, are you setting correctly PulseAudio? Hi, I followed you pulseaudio setup guid from source (http://youness.net/raspberry-pi/bluetooth-headset-raspberry-pi-3-ad2p-hsp) but I can`t run pactl list cards it returns some error (Assertion ‘t->dynamic’ failed at pulsecore/tagstruct.c:88, function extend(). Aborting. Aborted) so and if I run pacmd set-default-sink bluez_sink.xx_xx_xx_xx_xx_xx with my bluetooth mac adress it says: Sink bluez_sink.04:FE:A1:33:68:8C does not exist. So I my goal is to run a python3 script with pyttsx3 to read a text but a Pi Zero W has no audio on board and I wanna send it via bluetooth. (I tried a bunch of other guides but nothing is working … sometimes I can get pulseaudio to run via bluetooth but I can`t hear something and the connection dies really fast, and I can`t grab the card with pactl list cards even if I install it (pulseaudio) via apt-get). I can’t help you too much since I don’t have Raspberry Pi Zero W, but I recommend you to start again from scratch and just install PulseAudio with apt-get, maybe because you install PulseAudio two times you are getting errors.